Adobestock outperforming Shutterstock this month so far. Wow! Things are changing. Anybody seeing the same trend? 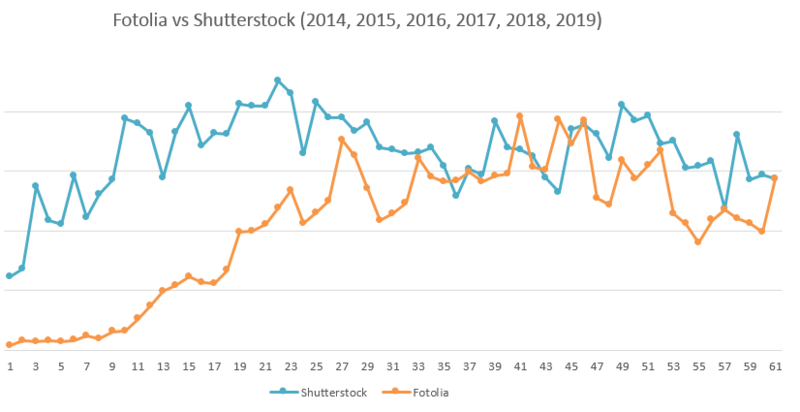 Shutterstock was vastly superior a few years ago (months on the x axis), then Fotolia/Adobe caught up and on some months even surpassed SS. Then they traded blows, but SS stayed on top. As for this February, SS earned 20% more, but that means little because shutterstock calculates the withholding tax when payout is due (and it's 30% for my dumb country without a treaty) and fotolia calculates the deduction immediately. So they might have earned the same so far. I'm concerned how slow Shutterstock is this month so far. Agreed, hopefully they will soon! Well hopefully, they will have the same editorial "standard" as let's say SS. AdobeStock has improved a lot, indeed! Their raise to $0.38/sub was an important factor, but not the only one. The only thing I regret is that the raise made my promotion to emerald obsolete, lol! But who cares! For me SS has always been and is better than Adobe. I sell many videos on SS. My income on the SS stands at around 1000 and 250 adobe per month. For me, Pond5 has been overtaking Fotolia sales for 2 years in sales every month. They have done a very good job with their contributors. I'm selling some photos there that SS does not sell. I often find adobe starts the month better but Shutterstock have always overtaken them by the month end its happening this month so far. Its been close but not yet beaten SS the gap is narrowing though. My SS sales (mostly images) are going down since 2013. Fotolia sales jumped this month Oct 2015. Is it Adobestock effect finally? Bad Behavior has blocked 60791 access attempts in the last 7 days.